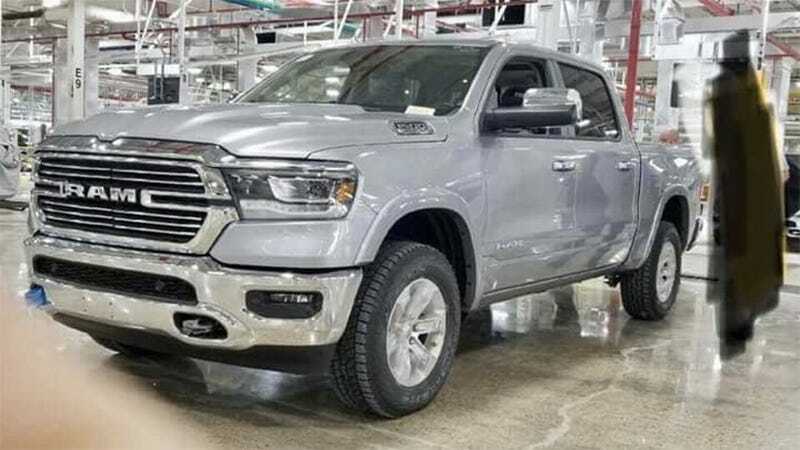 A redesigned 2019 Ram 1500 is slated to bow on Monday at the 2018 Detroit Auto Show, but a nice unmasked front quarter picture of one looking fresh off an assembly line has already popped up on Reddit. Check it out. You can pass your own on judgements on Ram’s new design choices. I’ll just point out that the shiny grille might indicate this is a high-spec Limited trim truck, and note that the “1500” badging indicating that this is a half-ton pickup appears to have moved from the door to the side of the hood. We’ll probably see a few different grille styles before the new Ram hits dealers. The mirrors on this truck also look particularly wide, even for a modern pickup. Perhaps the rig in this picture has a towing package. Since automakers won’t confirm or deny anything about future products, we do have to hedge a little bit and say that there is a slim chance this picture is faked or its some kind of prototype. But to me, it looks like a real picture and the truck looks like a finished product. The setting also looks like an assembly facility, which is one of the only places you’d be able to see this spanking-new machine right now. Ram’s official Detroit Auto Show press conference will take place at 9:05 a.m. est on Monday, Jan 15 but I expect we’ll have a big batch of official info on the new truck before you wake up for work next week.